There’s a common problem with artificial Christmas trees – they tend to look fake, have thin/bare spots, and they are never bright enough. 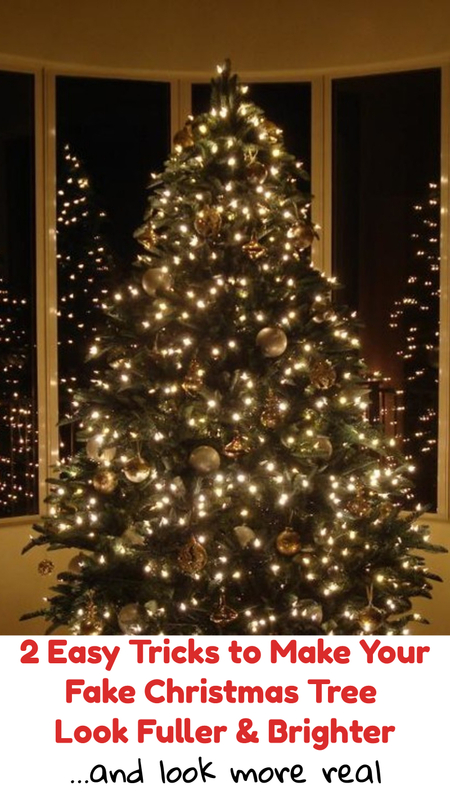 There are some simple ways to make your fake Christmas tree look much more realistic and look well…. much BETTER. Unless you have an awesome fake Christmas tree that looks real like these trees here, you’re gonna have to put a little extra effort in to make your tree look great. It only takes 2 little tweaks to get that bright and full look. Just get some cheap matching pine tree garland – preferably with lights – and wrap that around your tree to fill in the bare areas. This gives an instant more full look to your tree. To make your fake tree look brighter, just add more lights. Many pre-lit trees come with what seems to be a lot of lights, but in this case, it’s not enough. Simply adding more lights makes a world of difference! That’s all there is to it – use some cheap pine garland and add more lights. Need a new fake tree that looks totally real? => Check out our picks for the best REALISTIC-looking fake Christmas trees here. Or, see some great ideas for decorating your fake tree here. Christmas Decorating in the Living Room – LOVE this idea! BRILLIANT Way To Quit Smoking!